... 1821, Spanish Viceroy Juan de O'Donojú signs the Treaty of Córdoba, the terms of which ceded Spanish control of its North American colony, Mexico. (image credit) This ended the 11-year Mexican War of Independence, which had begun when "Napoleon's occupation of Spain led to the outbreak of revolts all across Spanish America." After a brief dalliance with monarchy, Mexico, which then spanned not only the Mexico of today, but much of the south/west quadrant of what's now the United States, would become a republic by 1823. Meanwhile, back in Madrid, "King Fernando VII did not recognize the Treaty of Córdoba, and Spain withheld official recognition of its former colony until 1836. 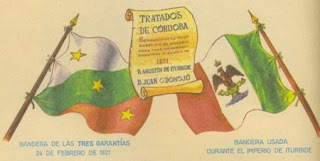 In fact, the last remaining Spanish troops, in San Juan de Ulua, did not surrender until four years later, and there was an attempt to reconquer Mexico in 1829."